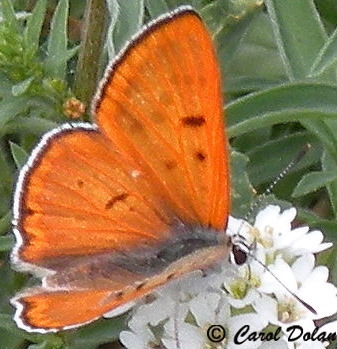 Identification: Upperside of male bright red-orange; female duller orange-brown to dark brown. Underside of both sexes gray-white to gray-yellow; hindwing with or without muted black spots. Wing Span: 1 1/8 - 1 5/8 inches (2.9 - 4.1 cm). Life History: Males perch in open areas and along streams or gulches to watch for females. Eggs are laid singly on or near the base of the host plant. Eggs hibernate. Flight: One flight from June-July at lower elevations; from July-August at higher elevations. Caterpillar Hosts: Dock (Rumex) species in the buckwheat family (Polygonaceae). 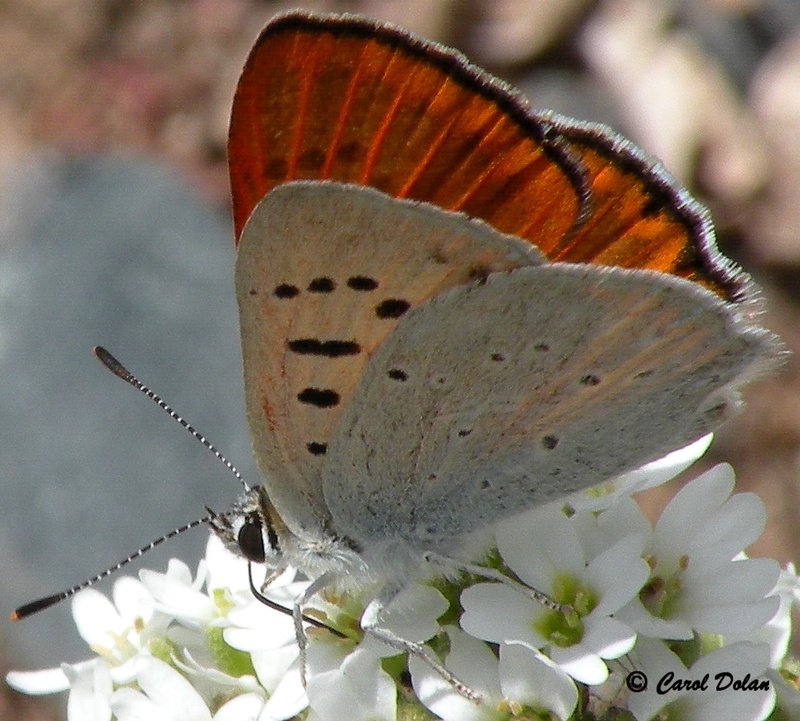 Habitat: Dry gravelly or sandy areas such as arid streamsides, sagebrush, scrub, dry fields, alluvial washes. Range: British Columbia east to North Dakota; south to central California, and northern New Mexico. Conservation: Not usually required. Nature Conservancy Rank: G-5, Demonstrably secure globally, though it may be quite rare in parts of its range, especially at the periphery.